Muro is a beautiful resort near the bay of Alcudia. The resort isn’t a big one, but is considered a peaceful destination away from the tourists’ masses elsewhere in Mallorca. The trip from the Son Sant Joan International airport to the resort would last about 1.5 hours by car. Mallorca holiday rentals are usually located in an area which is within a small walking distance from the spectacular beach of the Bay of Alcudia. Many villas have a swimming pool, a terrace, air conditioning and other domestic appliances that would satisfy you with the best indulgence options. Apart from the other resorts in Mallorca, the number of holiday villas is less abundant. Though, low cost cottages are also available and would ensure convenient accommodation options for 2 to 4 people. If you’re in Muro, you could reach the beach of the Bay of Alcudia on foot in about 20 minutes. The beach is wonderful with its white fine sand that rewards its visitors with an outstanding bathing experience. The beach has the best sunbeds, umbrellas and pedaloes. Also, equipment for wind surfing, water skiing and other water sport are provided. A few glass boats organize trips there too. 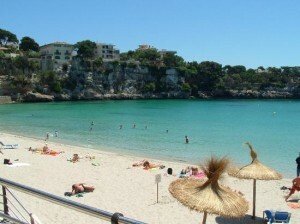 Tourists choosing Mallorca villa rentals in Muro are prized with many activities and amnesties. The original old town of Alcudia is an interesting place to visit. The remains of the town date to the 14th century. Walking tours are organized and visitors enjoy the impressive city walls of the town, the gates and other monumental structures. The S’Albufera Park is the gem of Muro and is a target for tourists who appreciate nature, as the park is filled with birds which fly from all parts of Europe. A local market is held in Playa de Muro every Saturday and is where tourists can purchase some rare craft goods. The Giant Labyrinth Wooden Maze is also one of the tourist attractions that are fun and exciting to visit. Local bars and restaurants are few but are usually crowded by visitors in the summer nights. Muro is a cool resort that guarantees you a perfect holiday in a peaceful environment. If you are looking for your ideal Muro villa rental, simply drop us an email and we'll get back to you with a custom selection of stylish villas and appartments just for you. We can arrange for a copy of our brochure to be sent to you too. Fill in the form below. This entry was posted on Wednesday, May 19th, 2010 at 3:07 pm	and is filed under Muro villa rental. You can follow any responses to this entry through the RSS 2.0 feed. Both comments and pings are currently closed.